Paul, the owner of Nationwide2Way, contacted us several weeks ago about website design information. He gave us a couple of sites to look at to compare with what he was looking for. Based on Paul’s budget, we did have to cut back on the options and features for his website compared to the other sites he provided us. The other sites were feature-rich with online catalogs of products, login forms, contact forms, slideshows, social networking integration, and much more. Paul was simply looking for a budget website to get an online presence with the ability to have a few e-mail accounts. Our website hosting service took care of his need for the e-mail accounts – which are included with the cost of our website hosting. After we received the initial payment from Paul, we got to work on the site and had the content and design done in a few days. 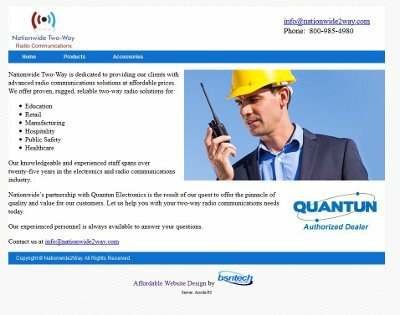 We appreciate the trust we received from Nationwide2Way with the creation of a budget-friendly small business website design service! Paul’s website is at nationwide2way.com.